To Cite: Jokar F, Yousefi H, Yousefy A, Sadeghi M. Behavioral Change Challenges in the Context of Center-Based Cardiac Rehabilitation: A Qualitative Study, Iran Red Crescent Med J. 2015 ; 17(6):e27504. doi: 10.5812/ircmj.17(5)2015.27504. Background: Cardiovascular disease is chronic and often a sign of long-standing unhealthy lifestyle habits. Patients need support to reach lifestyle changes, well-being, join in social and vocational activity. Thus, patient responsibility should to be encouraged to provide quality as well as longevity. Cardiac rehabilitation programs aid patients in the attainment of these objectives. However, research shows that behavioral change following the diagnosis of a chronic disease is a challenge. Objectives: We sought to determine behavioral change challenges in patients with cardiovascular disease to improve intervention programs. Patients and Methods: Using a descriptive qualitative approach, we collected the data using 30 in-depth semi-structure interviews. Thematic analysis was conducted to identify themes from the data. 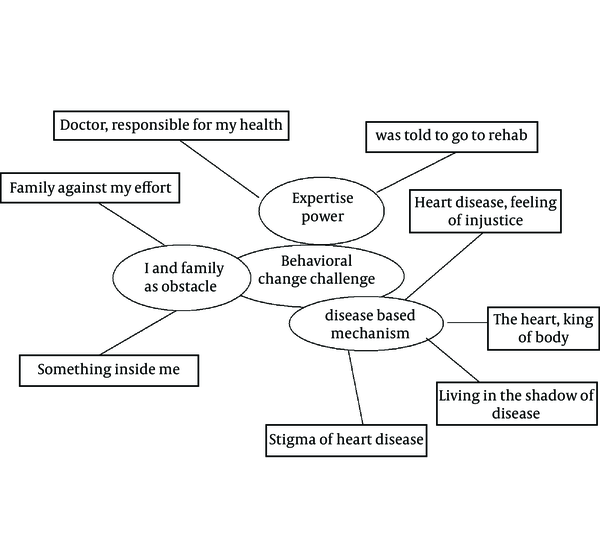 Results: Three sources of behavioral change challenges emerged regarding the nature of cardiac disease and the role of the individual and the family in the recovery process. These challenges acted at two levels: intra- and interpersonal. The intrapersonal factors comprised value, knowledge and judgment about cardiovascular disease, and self-efficacy to fulfill the rehabilitation task. Family overprotection constituted the principal component of the interpersonal level. Conclusions: Behaviors are actually adopted and sustained by patients are so far from that recommended by health professionals. This gap could be reduced by identifying behavioral change challenges, rooted in the beliefs of the individual and the family. Therefore, culturally-based interventions to enhance disease self-management should be considered. World Health Organization’s projections for 2030 suggest about 51.5 million deaths (76% of the global mortality), demanding a course of action based on improvement in lifestyle and health behaviors (1). Progress in the methods of the diagnosis and treatment of cardiovascular disorders has conferred increased survival. Cardiovascular disease is a chronic condition that often reflects long-term poorly lifestyles habits; therefore, health care systems in their endeavors to overcome this particular challenge require more than high-tech equipment and pharmacological interventions. Cardiac patients need particular attention to rebuild their life quality, restore or improve their functional capacity (2), and effect necessary lifestyle modifications to be able to resume their social and vocational role in society, all of which places great responsibility on the patient in the pursuit of enhanced quality of life and longevity. Thus, patient responsibility should to be encouraged to provide quality as well as longevity. Cardiac rehabilitation programs are a vehicle for achieving these goals (3). Human behavior plays an important role in health and disease. Therefore, behavioral interventions effectively improve disease management and quality of life. Behavioral interventions can also prevent disease and decrease health costs (4). Such interventions are vital to the effective performance of clinical medicine and community health and can be defined as a series of coordinated actions to change behavior (5). Psychological reactions to cardiovascular disease are different. The assessment of the prospects of recovery is one of the dimensions of psychological reactions (6). Health behavior models indicate that lifestyle changes after the diagnosis of a chronic disease may be difficult (7). These theories have not addressed the issue of behavioral change in the context of chronic diseases, however. The core tenets of health behavior theories propose that the diagnosis of a chronic disease should encourage lifestyle changes. A variety of social, cognitive, and emotional factors are associated with lifestyle changes (8), and psychological status is one of the most important factors that influence physical activity and social functioning (1). Societal costs in the absence of appropriate disease management increase the number of patients with chronic illnesses (9), which highlights the need for the development of behavioral and health care system interventions capable of facilitating lifestyle improvements among cardiac disease patients. The process of behavioral change comprises several steps, each of which presents its own challenges and demands that have to be mastered. Physical disabilities and a sense that “nothing helps” with heart disease progression are factors allied to unsuccessful behavioral change (10). Individuals' confidence in their ability to make changes to their lifestyle, together with their perception of barriers to these changes, can considerably impact their ability to adhere to the management plan (11). Accordingly, knowing patients' experience of behavioral change barriers can effectively help health care teams in the design of behavioral interventions. This study aimed to explore cardiovascular disease patients' experience of behavioral change in the context of a center-based cardiac rehabilitation program. The present study was commenced in November 2012 through interviews with individuals participating in a cardiac rehabilitation program at the two cardiac rehabilitation centers of Isfahan University of Medical Sciences. The inclusion criteria were comprised of attending at least 4 sessions of cardiac rehabilitation, diagnosis of ischemic heart disease, interventional treatment, high blood pressure, history of coronary artery bypass graft surgery, willingness to participate in the study, and absence of cognitive and speech disorder. Deemed best suited to provide a comprehensive picture of the phenomenon under investigation, purposive sampling was utilized for participant selection (12). The sample size was determined based on the principle of saturation, a process by which researchers collect and analyze data until no new themes are emergent. Saturation may sometimes be reached with 12 to 20 participants (13), and our research group achieved data saturation after the analysis of 30 interviews. The demographic and situational characteristics of the study population are depicted in Table 1. Using a descriptive qualitative approach, we collected data through in-depth interviews. Via open-ended questions asked during semi-structured interviews, the study explored the participants' comprehension of the challenges with which they were faced regarding behavioral change in a cardiac rehabilitation program. The first author (F.J.) referred to the two cardiac rehabilitation centers and furnished the potential study participants with comprehensive explanations about the research. Those who provided signed informed consents were asked to be present for interviews at a certain time and place. The interviews lasted between 45 and 100 minutes and were all digitally recorded. After the end of each interview, the interviewer noted the salient points during the interview. The interviews were transcribed verbatim. This study was approved by the Review Board of Isfahan University of Medical Sciences (# 391158). Participation was voluntary, and written informed consent form was signed by all the participants. The participants were reassured regarding confidentiality and anonymity. To preserve anonymity, all the audio data and transcripts were encoded. The study was conducted in accordance with the principles of ethical publishing. The version of a thematic analysis developed by Clarke (2006) provides a robust, systematic framework for coding qualitative data. So, thematic analysis was conducted to identify themes from the data (14). During data analysis, the authors adopted an inductive approach and independently read the transcripts, utilizing open coding techniques whereby the text was broken down and coded according to its meaning. The emergent categories and themes were compared and contrasted, and agreement was achieved through discussion between the researchers. The interview files were consulted if the responses or analyses required explanation. The process was recursive in nature, with the authors moving back and forth between the stages of data familiarization and concept development until the themes were agreed upon. The main theme, namely behavioral change challenges, reflected the participants' experience regarding behavioral change obstacles during rehabilitation. The main theme, themes, sub-themes, and their relations are shown in Figure 1. Three sources of behavioral change challenges include: 1) beliefs about the nature of cardiac disease; 2) the role of the individual and the family in the recovery process; and 3) responsibility for restoring health. Keeping one's illness secret is, thus, a threat to patient compliance with the treatment plan. Almost all the participants pointed to the theme of “the expert's authority”, with their acceptance of this superiority stemming from uncertainty in their own ability to manage the disease. Having one's motivation for achieving a healthy heart lifestyle undercut by one's own mood instability is another hurdle on route to desirable behavioral change. All the aforementioned themes are cognitive factor that can interrupt the process of behavior change so change behavior does not happen as the main consequence of cardiac rehabilitation. Behaviors are actually adopted and sustained by patients are so far from that recommended by health professionals. This gap could be bridged by identifying the challenges of behavioral change. The diagnosis of chronic diseases represents a potential “wake-up call”, a chance to make important lifestyle changes, so the patient moves back and forth between two opposite poles: the desire to change and the resistance to change in the context of cardiac rehabilitation. As is illustrated in Figure 2, the variables regarding behavioral change challenges among our study population acted at intra- and interpersonal levels. 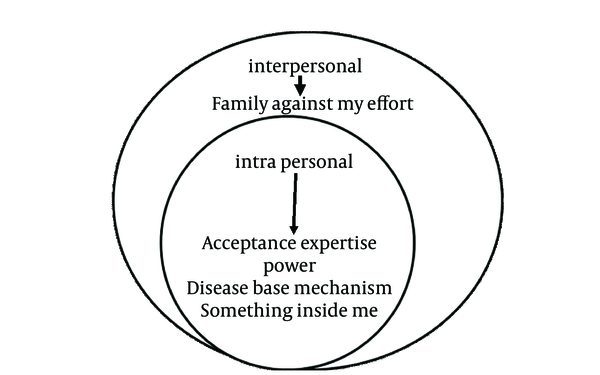 The factors at intrapersonal level were disease-oriented (heart disease, feeling of injustice; the heart, king of the body; living in the shadow of the disease; and stigma of heart disease), while those at interpersonal level concerned the patients' and their relatives' attitude toward the patients' capabilities after heart disease. A stigma is an attribute that extensively discredits an individual, decreasing his or her from a whole and usual person to a tainted, reduced one. Major et al. (15) (1998) suggested that stigmatization happens when an individual possesses (or is believed to possess) an attribute or characteristic that projects a social identity that is undervalued in a particular social framework. Stigmatizing symbols may be obvious or invisible, manageable or unmanageable, and linked to physical appearance and behavior. A self-stigma is defined as a phenomenon whereby an individual with a behavioral health condition internalizes a stereotype and applies it to herself or himself. Self-stigma interferes with help-seeking through three processes: 1) label avoidance; 2) diminished self-esteem; and 3) low self-efficacy (16). Our results showed that self-stigma impacted on the rehabilitation process through the participants' diminishing self-efficacy to begin behavioral change (Figure 1). The interpersonal variables that correlate with exercise among patients with cardiac disease include self-efficacy (e.g. one's belief in one's abilities to carry out an action). Self-efficacy is an important predictor of behavioral change (17). Cardiac patients' view on the importance of the heart in the body can be improved by providing correct information about their heart problem. The association between health knowledge deficit and failing health has been supported across acute and chronic diseases. Educational interventions should be literacy-sensitive and aimed at improving patients' health knowledge and self-efficacy as well as encouraging self-care behavior and promoting health outcomes (18). Patients tend to draw upon their cognition and emotional beliefs regarding their illness to “make sense” of it. Such conceptualizations are formed based on beliefs about the chronology of the disease and its consequences, emotional response to the disease, beliefs about personal control over the illness and treatment efficiency, and the degree to which persons perceive sufficient understanding of the disease (19). Perception of an illness is not generally predicted by the clinical measures of illness severity, so there is no association between beliefs about the illness and the clinical markers of the illness (20). Thus, disease self-management behaviors are guided by patients' cognitive representation of the illness. Patients' beliefs about an illness and what it means with respect to their life are allied to their perception of the illness. The most important components include cause, timeline, consequences, symptoms, and cure or control. Patient models vary wildly across chronic conditions among individuals with the same disease severity (21). The relative impact of chronic diseases on the quality of life is diverse across similar conditions (22); thus, behavioral change challenges may vary because of the different perceptions of the illness as a threat to the quality of life or health. Cardiac self-management can often be ambiguous to many patients who have previously expected that their conditions would be solely managed by their physicians. “Disease-based mechanism” is a theme discussing disease-related beliefs that are liable to hinder behavioral change. That is why behavioral change interventions should be aimed at altering these beliefs. Patients' perception of their cardiovascular disease should be assessed during cardiac rehabilitation, and educational and psychosocial interventions should be devised to ensure that it does not act as a barrier to the behavioral change process. Cardiac patients with positive expectations about their chance of recovery and return to a normal lifestyle are believed to enjoy better long-term survival together with better functional status. Various potential clinical, demographic, and psychosocial variables do not contribute to creating these effects (6). Patient and family also act as a barrier to behavioral change in two ways: our study participants expressed their uncertainty about accomplishing their task in cardiac rehabilitation sessions; this negative judgment about their own ability acted as an obstacle to their engagement. Based on the research results, self-efficacy is a key element in heart disease self-management programs. The interdisciplinary nature of the program and the design of the framework of behavioral change theories result in patient-centered programs (23). Previous research has demonstrated the importance of family support in the recovery of cardiac patients. In contrast, our study population cited family overprotection as a hindrance to their ability. Cultural diversity is another variable of significance that merits due attention. For all cultures that accord great value to individualism and autonomy, there are those that attach great import to interdependence (24). In the context of Iran, the extended family underpins the individual's societal role. Consequently, the whole family feels obliged to provide care for its members in sickness. Nonetheless, the degree and type of the involvement of the family in the care of patients are largely unknown. Also, patients with chronic illnesses do not always experience family involvement positively. Chronic disease patients receiving family care often complain about being criticized and nagged at and, as such, are made to feel guilty about the care (25). The behavioral change challenges originating from the interaction between our study subjects' values system and cognitive system are illustrated in Figure 1. The importance of modifiable risk factors for the prevention of premature mortality in cardiac patients is widely recognized by researchers and public health professionals. Our results suggest that during the cardiac rehabilitation program, our study population's behavioral change challenges acted at two levels: interpersonal and intrapersonal. At intrapersonal level, factors such as value, knowledge, attitude about heart disease, self-efficacy to fulfill the rehabilitation task, and family overprotection were the main issues that emerged. Therefore, it is advisable that culturally-based interventions be formulated to bolster disease self-management. This study was part of the PhD thesis of the first author, conducted in cardiac rehabilitation centers affiliated with Isfahan University of Medical Sciences. The authors would like to thank all the participants, who made this study possible. Funding/Support: This research was financially supported by Isfahan University of Medical Sciences, Isfahan, Iran.